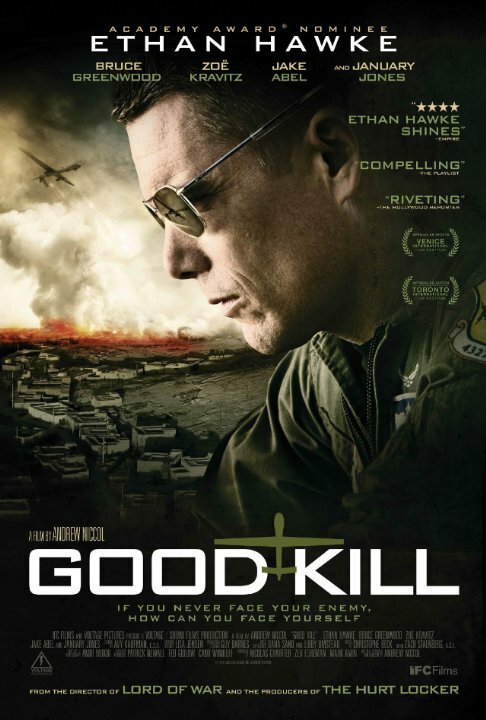 What exactly constitutes a “good kill?” And is there even such a thing as one, or are these two fundamentally different words just put together to try and justify war and conflict? With drone warfare becoming an increasingly more common tactic in the arsenal of tools used by the American military, these are some of the most pressing moral and political questions of our time. And these are the exact same questions posed in the appropriately titled Good Kill, a thought provoking modern war film, where the most thrilling sequences take place behind controllers and video monitors, in a trailer-sized bunker in the middle of the Nevada desert. After premiering at TIFF, the film finally opens today, and it’s got a rock solid performance from Ethan Hawke, to boot. Major Thomas Egan (Ethan Hawke) is an Air Force officer who now works as a drone pilot, locked in a bunker all day under the command of Lt. Colonel Jack Johns (Bruce Greenwood), firing unmanned missiles at selected targets in Afghanistan, before going home to his wife (January Jones) and kids. But he can only manage living this privileged suburban life for so long, before the trauma and guilt of his work catch up with him and take their toll on his personal life. The film becomes a sobering character study, as he comes to question his actions in a war seemingly without end, where killings are carried out from behind screens that dull the affects of the actual violence, and innocent lives are inevitably affected by the remote controlled explosions. Director Andrew Niccol, who explored similar themes in Lord of War, stages some suspenseful and exciting sequences in the control room, forcing the characters to confront the shaky morals of their actions, as his screenplay draws strong comparisons between video games and real life violence. The most engaging subplot involves a poor woman whom they witness being raped every day in her garden, with her attacker unaware that he is being filmed by the always monitoring eyes in the sky. They are physically unable to rescue her and stop the abuse, and they aren’t allowed to use their overriding power to stop him, because he’s not the designated target. They are forced to just helplessly watch, unwillingly becoming witnesses to an assault that they can’t do a damn thing about, and it’s in setting up these impossible to solve moral mind games that Good Kill is at its strongest. The domestic scenes unfortunately aren’t quite as gripping, with the subplot involving his increasingly estranged wife sometimes veering into melodrama, especially at the end. Thankfully, Ethan Hawke sells the role every step of the way, turning in a compelling and nuanced performance that brings fascinating complexity and genuine emotional depth to his character. His performance, and the morally ambiguous questions posed even just in the title, are what make Good Kill especially worth seeing.